Swimming to Mexico, the Skinny on Dipping in Texas. but you’re going to have trouble with those boots. In 1968 I saw a movie with Burt Lancaster, actually I never met Burt Lancaster, let alone saw a movie with him. I mean he was starring in a movie I saw called "The Swimmer", based on a short story by John Cheever. Basically, it was Burt showing up at people’s doors asking to use their pool. He had figured that his friends’ houses formed a chain of pools that would eventually reach his house. After being treated coldly, rudely and scornfully by mostly former friends, he discovered what we all know which is "you can’t swim home again". He shows up to an empty house and we piece together that he was a rich executive who had mistreated wife, mistress, daughters, friends, and pets and was now getting his comeuppance. The final scene shows him huddled in an empty pool with terminal goose flesh no longer able to keep reality at bay. One day, after not taking my medication for two days, I was staring at a map of Texas and I noticed that one could follow in Bert’s wet footprints and swim not home, but to Mexico. No shirt, no shoes, no problem. Not only would this be a great way to keep cool, but thanks to the state parks and rivers conveniently spaced along the way, you wouldn’t even have to knock the door of former friends to ask to use their pool. So I suggested this to my wife and she happily went about getting ready. Two days later we were on our way. Although we live considerably east of Austin, close to Lake Inferior, we planned our trip with Austin as a point of departure. We didn’t include Barton Springs, (as Yogi Berra allegedly said, "It’s so popular no one goes there anymore. "), and Lake Travis has too many jet skis. Our idea was to swim tranquilly to Mexico. After a hearty breakfast of tacos at Anita’s Restaurant in Bastrop we headed to McKinney Falls. Austinites who have been there can skip this stop if they want. The reason we include it is "The Statue of Liberty Syndrome", which is a tendency not to visit nearby attractions because "they’ll always be there". Get a Texas State Park Pass for $70 (Apr 15, 2014 rate). This will enable you to enter as many State Parks or State Historic Sites as many times as you’d like for an entire year. Since our trip includes visits to at least six State Parks and a nearby State Historic Site, you can see that this Pass will or nearly will pay for itself on this trip. Purchase at any Texas State Park or call 512-389-8900. 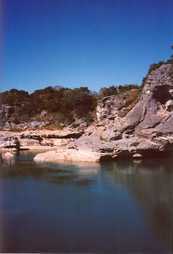 For all rates and reservations call 512-389-8900 or go to www.texasstateparks.org. Day use does not require reservation. You’ll be in San Marcos before you dry off from your Onion Creek dip (sounds like it could be marketed). I’m not going to tell you how to get to San Marcos because if you can’t get to San Marcos from Austin, just turn around and go home and watch the Terminator for the 16th time, because you’re not going to survive the trip. Exit 206 and turn right onto Aquarena Springs Drive. About half a mile on your right you’ll see the entrance to Aquarena Springs. 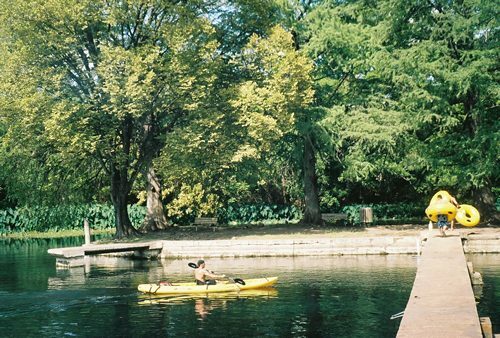 A historic park open to the public seven days a week, the San Marcos Springs are the source of the San Marcos River and their year round glass-bottomed boat rides (for a small fee) are a thrill for those that haven’t done this before. Our idea of a thrill is glass-bottomed elevator rides. 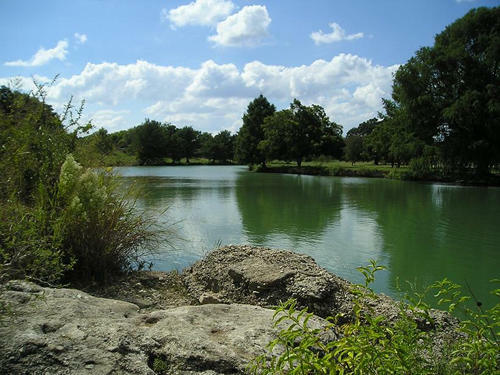 Aquarena Springs (today Meadows Center for Water and the Environment) has been in the hands of Texas State University-San Marcos since 1994. If you have dismissed the Springs as just another roadside attraction, reconsider. Silver Springs in Florida is perhaps a little grander and yes, the Tarzan movie underwater scenes were filmed there. But you also stand the chance of being mugged by overly aggressive squirrels, and Aquarena Springs is 1200 miles closer. Besides, we’re swimming to Mexico, not Cuba. Aquarena Springs Drive will become C.M. Allen Parkway. Continue past Sessoms and University Drive. On your left before you get to Hopkins is the San Marcos Convention & Visitors Bureau. 888-200-5620. The bureau has an excellent "Windshield Tour" of San Marcos listing 29 historic buildings and their histories, including the 1908 Beaux Arts Hays County Courthouse which has just undergone restoration. On the southeast corner of the square is an exception to the rule that all courthouse annexes must be monstrosities. Behind the bureau is the 1893 Old Fish Hatcheries Building and before you say "I thought they only hatch young fish", be advised everyone says that. There’s also a footbridge with an excellent view of the San Marcos River which connects to the City Park. Continuing on C.M. Allen Parkway you’ll cross the railroad tracks and then a second set further on. Immediately after the second tracks make a left into Rio Vista Park and continue through the parking area until it dead-ends at a basketball court. This area offers a nice canopy of cypresses and a little island reached by a footbridge. Abundant giant caladiums line the riverbanks. Here we watched swimmers greet a lone canoeist as he drifted leisurely downstream with his dog. The river with its constant temperature of 71 degrees is the only place known where Texas wild rice grows. Two rare species of fish dwell here, as does a large 10-12 inch prawn. I read it in a book; I’ve never seen one, so I’m not sure if it means there’s just one prawn that’s 10-12 inches or if there’s hundreds of thousands. Swim here and look for the prawn. 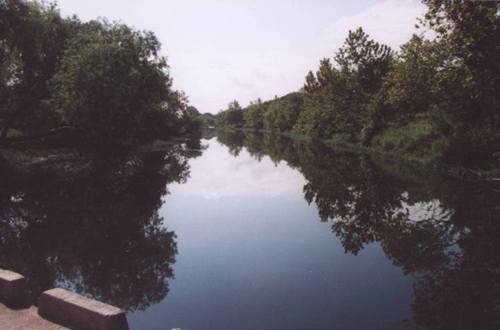 For Type A personalities, San Marcos is host to the Texas Water Safari every June. A marathon endurance canoe race against time (100 hours) to reach the Gulf of Mexico. Hopkins St. will become Ranch Road 12 for your trip west to Wimberley and/or Blanco. Follow RR12 to Wimberley. As for our tour, this is the first we’ll see of the Blanco River. The water is crystal clear and the view serene, however, public access is very restricted. Another unusual thing about Wimberley is one wonders where the locals live. Are they bussed in? Comfort, Boerne, and Llano all have residential neighborhoods that you can wander through so you can get a feel for the town. If you like Wimberley you’ll love Eureka Springs, Arkansas. If you’ve been to Eureka Springs you may want to go straight to Blanco. Backtrack 4 miles and turn right at the T. RR 32 takes you across the Devil’s Backbone to Blanco. An unusually scenic drive, you will pass several roads leading to Canyon Lake and after 33 miles will intersect with Hwy 281 a few miles south of Blanco. We’re now getting to a point on our trip where the crowds are thinning a bit. The last time we saw Blanco was January 2nd 1996. It was about 36 degrees, and very windy. The bleak and deserted square contained a small weathered two-storey building that Andrew Wyeth would’ve loved to paint. I don’t mean on canvas, I mean this sad building needed some latex exterior bad! There was something about it that resembled a courthouse, but it took a lot of imagination to imagine that. Our recent visit couldn’t have been more different. No Reggae. 90 degrees and a beautiful gem of a building shining like a new penny over a scorched square that seems to have shrunk as much as the courthouse grew. The county seat was moved to Johnson City in 1890, and this building (see Blanco) by architect F.E. Ruffini served as a bank and a hospital after it’s brief 5-year stint as a courthouse. With its recent restoration, it is now perhaps the finest example of a former courthouse in the state. This and 37 other buildings are in the National Register of Historic Places. Blanco activities include Market Day the third Saturday every month from April through November, and holiday events through the month of December. There’s also no shortage of specialty shops and Bed and Breakfasts. Blanco Chamber of Commerce: 210-833-2201. 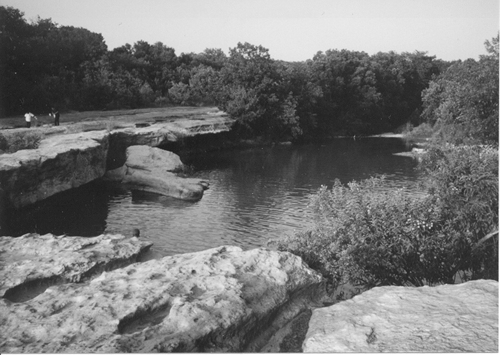 In the 1960s Blanco State Park was nearly taken off the rolls due to poor attendance. It my be a State Park to you and me, but it’s also a city park to Blanco, being a mere two blocks from the town square. Besides swimming, fishing is popular here as well, with the Parks and Wildlife Department releasing rainbow trout each winter. Take a dip in the river, explore the town and make plans for a future visit. From Blanco you head North on 281 to Johnson City. Shortly after entering the city limits, the first intersection you come to is 2766, look to your right for the sign to the park. The park entrance is approximately 8 miles. 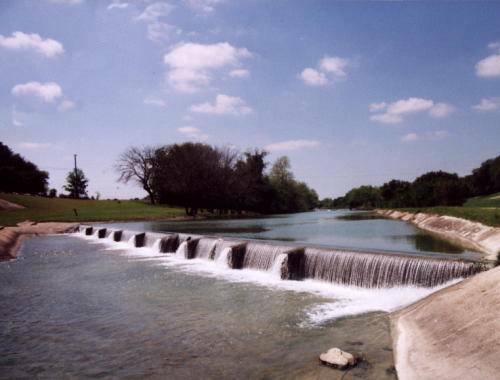 During the drought of '98, the water at "the falls" was a trickle, and the Pedernales River can’t be entered from the first 2.5 miles below the falls. The park map and signs will direct you to a much closer access, but whether you visit the falls, the river or both, it’s a bit of a hike.